Workers in nuclear power plants, nuclear research facilities, and medical laboratories need to constantly monitor their exposure to potentially harmful radiation. Thermo Scientific™ EPD Electronic Personal Dosimeters monitor exposure to ionizing radiation in real time and emit both audible and visual alarms so that personnel can react quickly when an accecptable dose rate level is exceeded. With excellent response to gamma radiation, beta radiation, neutron radiation, and x-ray-radiation, EPD Electronic Personal Dosimeters ensure safety in any environment. Excellent response to gamma, beta, and X-radiation. 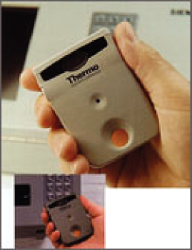 Single stand-alone dosimeter or part of a comprehensive dosimetry management system, such as webREMS or ViewPoint Enterprise. Advanced radiological performance, 15keV to 10MeV, in a small, lightweight design. Most complete dosimeter per IAEA Active Personal Dosimeter Intercomparison study IAEA-TECDOC-1564. Excellent power management and battery monitoring. Excellent immunity to electromagnetic interference. Easy-to-read display with optional backlight. Rugged battery cap and enhanced clip retention. Excellent performance in mixed gamma/neutron fields and for low-dose measurements. Advanced radiological performance, 20keV to 10MeV (photon), thermal (0.025eV) to 15MeV (neutron). Direct display of Hp(10) for neutrons and for photons. Outstanding immunity to electromagnetic interference. Compatible with current or upgradeable Thermo Scientific EPD readers, software and accessories. Excellent response to gamma and X-radiation. Compatible with Thermo Scientific EPD teleadapter for wireless operations. Establishment of reference calibration data of new stock. Allocation of stock to user definable work areas or locations. Plain English fault diagnosis and reporting. Tracking of units sent for repair or maintenance. Interface to calibration checking procedures for external irradiators. Fully automatic integration with the Thermo Scientific™ Auto Irradiator. Production of calibration check reports. Three-way external alarm unit for EPD Mk2 Electronic Personal Dosimeter. LED light from the EPD activates the vibration and audio alarm through fiber hook. Easily attached, optional, audible earpiece alarm. External audible alarm jack capability.